I always used to favour TimeOut guides when travelling, as they seemed to be the most hooked in to cool and unusual things to see, great bars and restaurants, etc. Nowadays, I'd be more likely to rely on an iPhone app or the web, because print guides are around 6 months out of date even before they're published, and then they're only updated once a year at best. 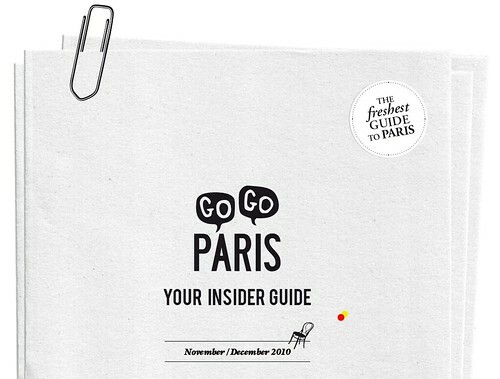 Gogo Paris used to be a small, regular print guide to the city, and a great read it was too. Very hip, with lots of excellent, quirky, interesting things to see and do, I was a bit sad to see them stop publishing and go web-only. I thought the move probably spelt the beginning of the end. I was wrong. 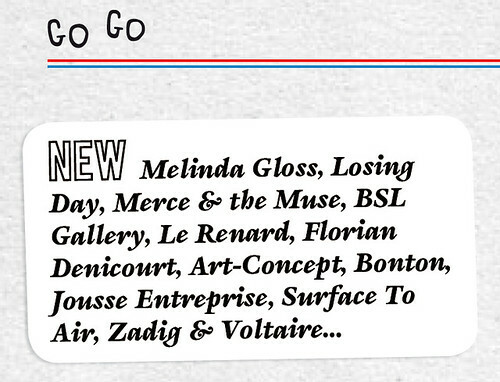 Since then, Gogo Paris has gone from strength to strength, their website and Twitter feed are essential, and - best of all - bang up to date. 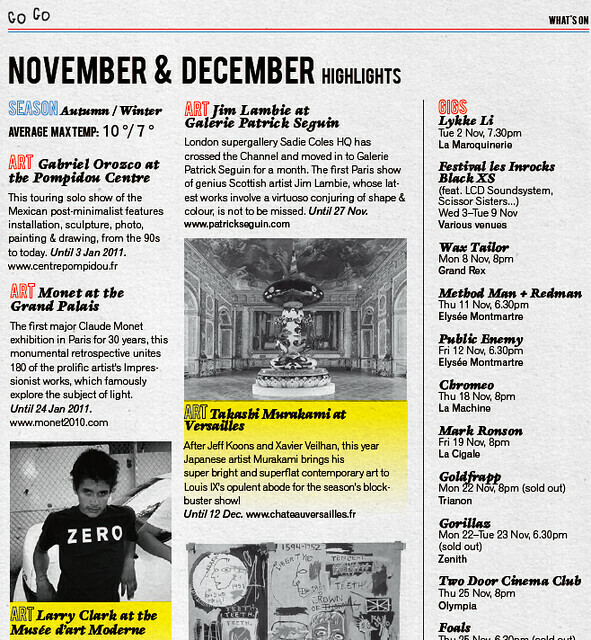 They have loads of info about new fashion events, openings, the best exhibitions, gigs... basically the sort of guide I'd like to have for every city I visit. It's like having a plugged-in best friend living in Paris. I've been here for nearly twenty years now, and many of the tips I could give would be the same as theirs. Recently, Gogo have started producing bi-monthly PDF guides, which is a brilliant idea, and I decided to take the plunge and buy one. 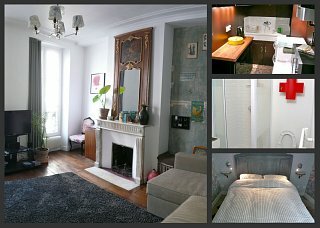 At 10€ it's not cheap, but it's well laid out, there's an awful lot of bang-up-to-date info in there, insider tips from Paris illuminati... and they even mention the Great/Canal apartments! I think that means we are now cool. ...and you can click on the links given to go directly to the websites of each place mentioned. 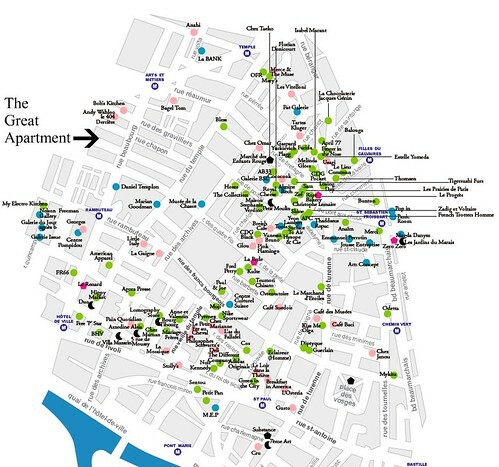 Just look at all the stuff they recommend for the area around the Great Apartment! Each dot is something great! With over 50 pages of info, the Gogo Guide is a concise, stylishly-presented and hip resource that will help you get the most out of your stay. It must look excellent on an iPad (if only I had one), and their iPhone app is coming soon too. Yay! There are however a few improvements that could still be made. I'd like to be able to click on an address and be taken to Google Maps for example. The index isn't clickable either, which would make referring to articles a lot simpler. And the price may also make you think twice; On one hand, it's only 10€, less than an (out of date) paper guide, barely more than two beers. On the other hand, it is a full 10€ for something that will basically be replaced by a newer version in two months' time, and 10€ is quite a lot compared to, say, iPad apps of magazines that typically offer the latest edition - with a lot more interactivity - for less than 5€. 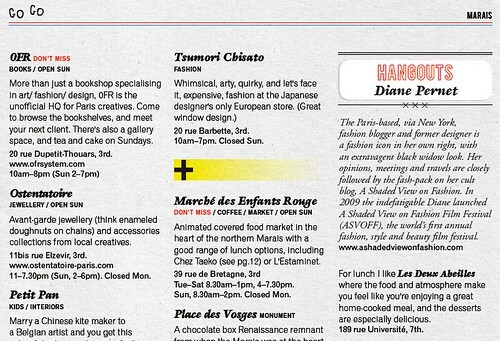 Those niggles aside, I'd recommend Gogo Paris' guide without hesitation. You can get the latest edition here. Go go!